절벽의 바위면을 깎아 만든 높이 5.5m의 고려시대 마애여래입상으로, 암벽의 모서리 부분을 중심으로 양쪽에 조각된 특이한 구도를 보여준다. 얼굴은 비교적 원만하고 부피감도 있지만, 가는 눈과 작은 입에서 신라시대의 마애여래입상과는 다른 특징을 찾을 수 있다. 어깨나 팔의 부드러운 굴곡은 얼굴에 어울리는 형태미를 묘사하고 있어서 상당한 수준의 조각가에 의해 만들어졌음을 알 수 있다. 그러나 옷자락을 잡고 있는 오른손이나 지나치게 큰 왼손, 둔중하게 묘사된 두 발, 경직된 U자형의 옷주름 등에서 신라시대보다 둔화되고 위축된 고려시대 조각의 특징을 확인할 수 있다. 이러한 특징은 불상이 딛고 서 있는 반원형의 연꽃 대좌(臺座)와 부처의 몸 전체에서 나오는 빛을 형상화한 광배(光背)에서도 나타난다. 이 마애여래입상은 얼굴·신체·옷주름·광배 등에서 신라시대 보살상보다 형식화가 진전된 고려시대의 마애여래입상으로 볼 수 있다. 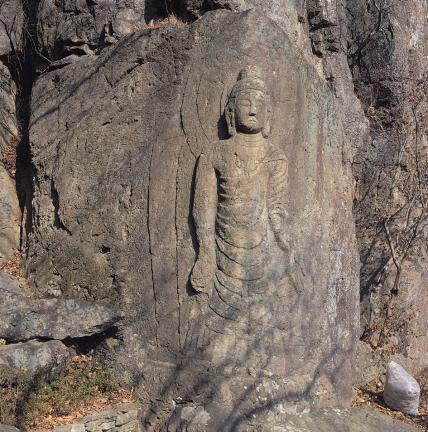 This 5.5-meter high standing Buddha was made during the Goryeo Dynasty by carving the face of the rock of a cliff. 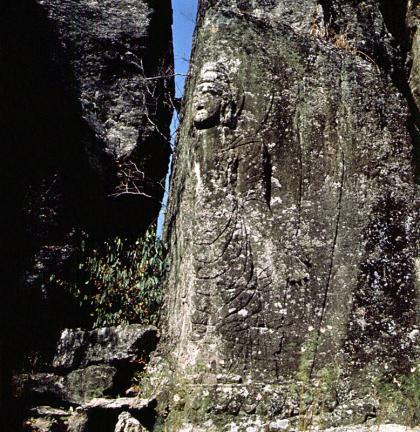 It has a peculiar structure, since it was carved on two sides of the rock centered around a corner. 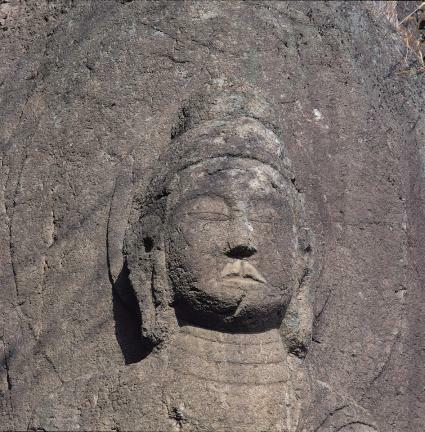 The face is relatively smooth and it has volume, but the narrow eyes and small mouth are different from other rock-carved standing Buddhas made during the Silla period. The gentle curves of the shoulders and arms match the face, which indicates that this work was done by a very skilled carver. 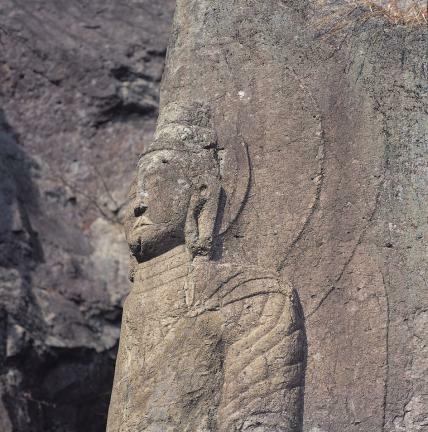 However, the right hand holding the hem of the clothing, the oversized left hand, the heavy-looking feet, and the rigid-looking 'U' shaped folds in the clothing are depicted in a less vivid way than in other works of the Silla period and are more similar to Goryeo sculptures. Such characteristics are also apparent in the lotus flower pedestal shaped in a half circle on which the Buddha is standing, and the mandorla (Buddhist halo of light), which gives shape to the light emanating from the body of the Buddha. 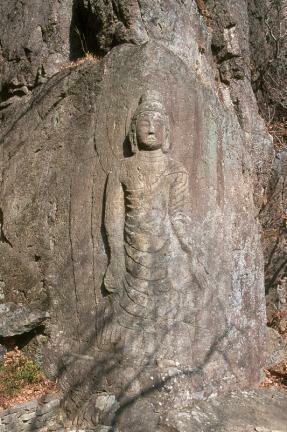 Based on the formal mode of expression on its face, the body, the folds in its clothing, and the mandorla of the statue, it is assumed that this rock-carved Buddha was made during the Goryeo rather than the Silla Dynasty.